Dr. Horiuchi earned both his B.S. in Electrical Engineering in 1989 and his Ph.D. with Prof. Christof Koch in Computation and Neural Systems in 1997 at the California Institute of Technology. His Ph.D. work focused on the design of analog VLSI circuits that mimic the neural circuits underlying saccadic eye movements in the primate. This work included the design of visual processing chips, auditory localization chips, non-volatile floating-gate learning, motor control, and attentional processing. He went on to do his postdoctoral work with Prof. Ernst Niebur in the Zanvyl Krieger Mind/Brain Institute at the Johns Hopkins University. 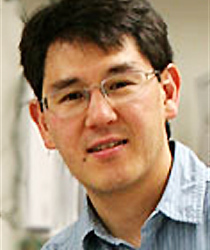 In September 1999, Dr. Horiuchi joined the faculty of the Electrical and Computer Engineering Dept and the Institute for Systems Research at the University of Maryland. He continues to pursue the development of VLSI models of neural systems at the spiking neuron level and their demonstration on robotic platforms. His current focus is the understanding of the bat echolocation system. As a Fellow, he will participate in a year-long program to redesign ENEE 303 (Analog and Digital Electronics). Power-law compression can expand the dynamic range of a neuromorphic echolocation system. Research will explore processes that support spatial perception and navigation in the echolocating bat. Defense funding supports research on visual reasoning, animal-inspired flight, network security.